I have been trying to buy up every last peach, tomato, berry and plum, because in a few weeks, there will be nothing, and we will be in butternut squash and Brussels sprouts mode (not such a bad thing). Hurry up and make these last summer fruit cobblers, crisps and cakes. September in NJ is the BEST time for produce. I bought these just picked Santa Rosa plums at my favorite farm market, and since I was not familiar with this red variety of thick skinned plums, was not sure what I was going to do with them. I had heard they were watery and not great for baking, but I beg to differ. 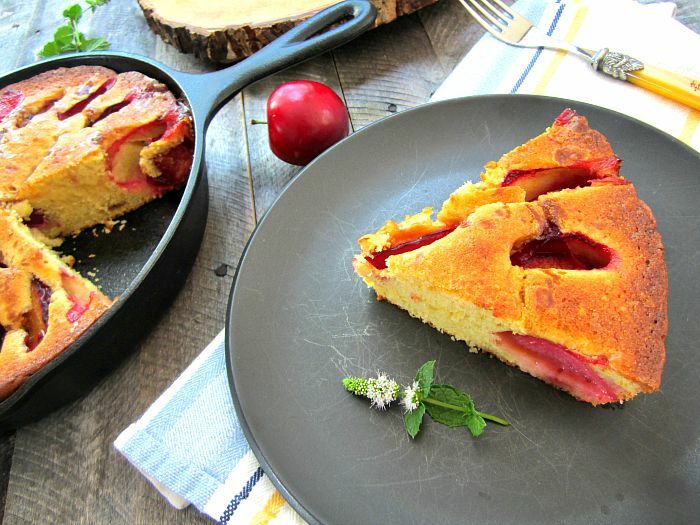 I made this Santa Rosa Plum Cornmeal Skillet Cake and it was fantastic. Not too sweet, and just right for breakfast. I am making it again to bring to my mom's this weekend for Rosh Hashanah. If you don't have buttermilk, then use regular milk with some lemon juice mixed in. I had the buttermilk leftover from that fig upside down cake, so I used it. 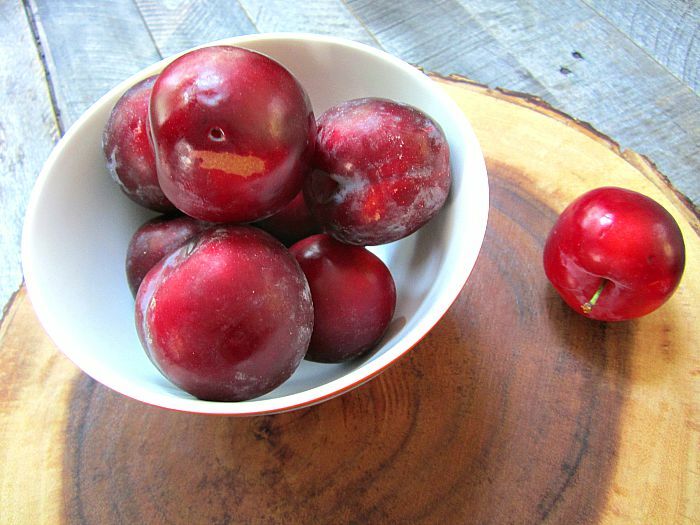 You can use any variety of plums here, but this variety was lovely. Mix the flour, baking powder, cinnamon and salt together in a large bowl. In another bowl, mix the eggs with the butter and sugar, extract and the rest of the ingredients. Add the dry ingredients to the wet ingredients, incorporating to make a nice batter. 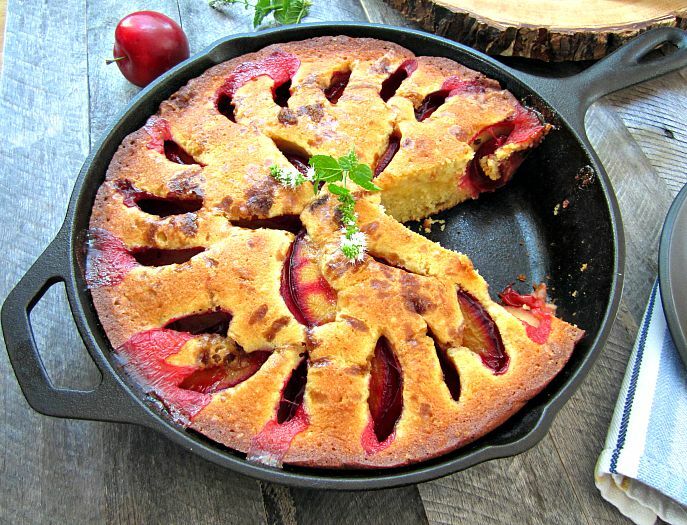 Pour into a well greased 9" cast iron skillet (you can also bake this in a springform pan). 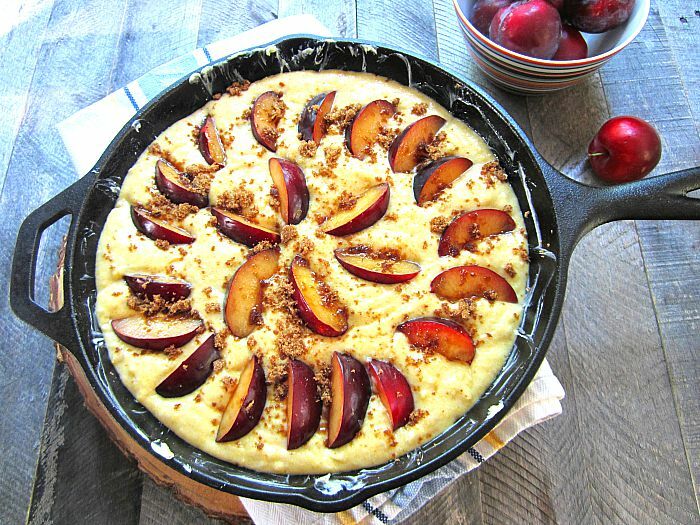 Lay quartered plums concentrically into the batter and sprinkle with brown sugar. Since I baked it in cast iron, I set my oven to 325F, but if you bake it in a cake tin, then turn the temp to 350F. Delicious warm w/ vanilla ice cream. 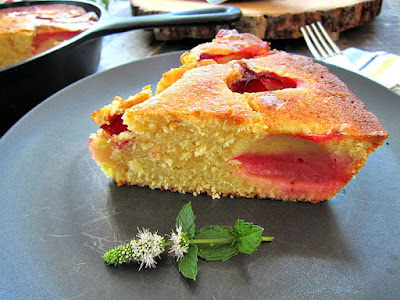 I've baked several of your olive oil cakes, as well as cornmeal cake recipes and they've all been a hit with my family & friends. This looks like a nice easy recipe that will please everyone. Can't wait to try it this weekend. Cornmeal. plums, buttermilk and ice cream, sounds superb, but I can't make this stuff, Tony has no control, he can't grasp what moderation means, ha ha. He always drools at your dessert posts! That looks gorgeous and I'm sure it's delicious. Yum. I love September too! I just caved and picked up a butternut squash - but I will enjoy the NJ summer fruits until the bitter end. I need to search out plums now and make this. Looks amazing! I couldn't wait; so I stopped on the way home from work last night to purchase plums and made this luscious treat after dinner. I served it for breakfast this morning and brought slices to the office for my co-workers. Everyone loved it. I did add a bit more Almond Extract to mine.